'Binoculars, Prismatic, 5 x 40 MK.IV,'. Stores reference 6E/383. Manufacturered by Ross under R.A.F. contract. 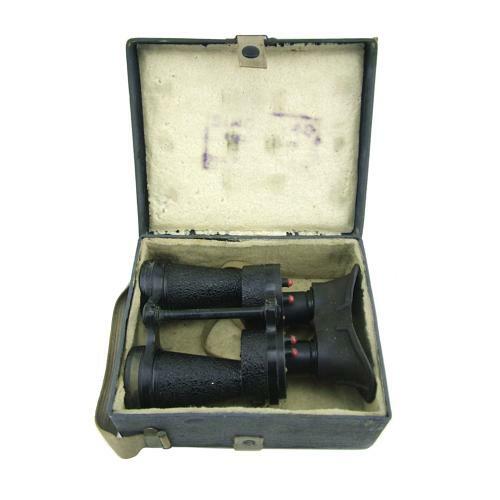 Introduced in 1941 these substantial 5 x 40 fixed focus binoculars have coated lenses and large single piece black rubber eye shield helping maintain night vision. The relatively large diameter of the objective lens (40mm) allowed increased levels of light to pass through. Although primarily designed for night use, this instrument was also suitable for the identification of objects at long range, and reconnaisance duties by day. This made them suitable for use by nightfighter and Coastal Command crews for spotting aircraft, shipping and U-boats as well as personnel in airbase control towers. These show average use and wear. There is some rubbing of the the paint finish where the binoculars have been stood up vertically but the optics, although having minor marks, give a good clear and crisp image. The rubber eyeshield is has some surface crazing but is complete, quite flexible and make the binoculars very comfortable to use. Olive drab webbing neckstrap. With war department broad arrow mark and RAF reference codes marked on the casings. The binoculars come in the original felt lined grey fibreboard case. Stock code M23457.